It could only have been providence. This is what fire brigade staff in Arkansas, America, said after a baby was thrown from a car that was involved in an accident with a heavy truck. Jakesia Colson was in her car with her daughter, Bryce (8 months), and a passenger, when the 18-wheel truck hit the left side of their car. The impact seriously damaged that side of the car and Jakesia and her friend were slightly injured. What was worse was the empty back seat where the baby had been sitting seconds before. “I ran up and down the highway looking everywhere for her, calling her name,” the emotional mom said later. “I didn’t hear her crying, nothing. I panicked. I thought she was gone. It was the worst 15 minutes of my life.” Firemen said when they arrived at the scene they found Jakesia screaming that her child was missing. Captain Charles Smith and another fireman immediately combed the area, sifting through heaps of cut grass. The grass beside the road had recently been mown. Then they heard a baby, not crying, just making a baby noise. They could hardly believe their eyes when they saw the baby sitting in a storm-water drain and looking at them as if waiting to be fetched. Apart from a scratch on her forehead she was unharmed. She’d fallen between the steel grating covering the drain and the cut grass that had fallen on the grating and in the drain had apparently cushioned her fall. Her car seat was found near the car. “There had to have been some kind of divine intervention for her to end up okay the way she was,” Charles said gratefully. “I’m blessed! I know it was a miracle. 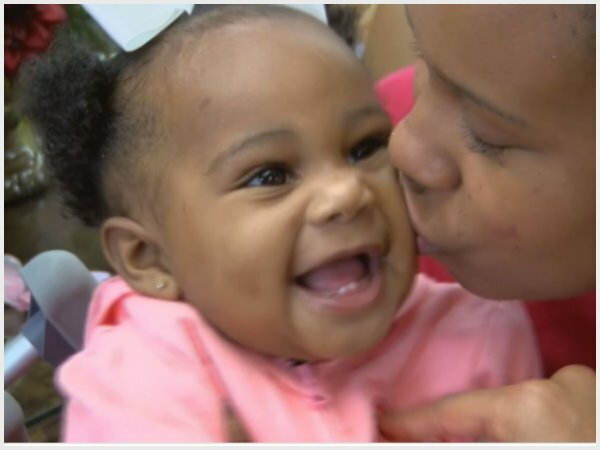 She's still the same - she's still my happy baby,” her overcome mom said.